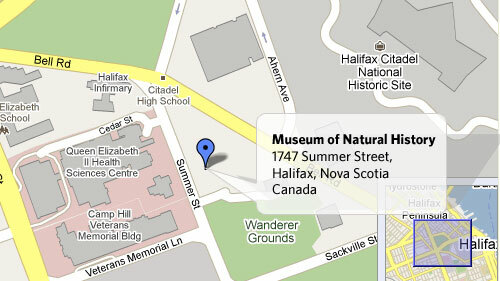 The Museum of Natural History is located at 1747 Summer Street in the heart of historic Halifax, Nova Scotia, Canada. We are just one block north of the Public Gardens, and west of Citadel Hill National Historic Site, and just south of the Halifax Commons. See our Google Map for further directions. Parking The parking lot entrance is on Summer Street. Parking is $1.50 per hour: coins or credit cards are accepted. The parking lot is managed by Partners in Care: Capital Health Parking Services. Revenue raised by Partners in Care is used to purchase Priority Patient Care Equipment. * these buses do not stop on Summer Street during the weekends or holidays.